Nile tulip tree | Infonet Biovision Home. 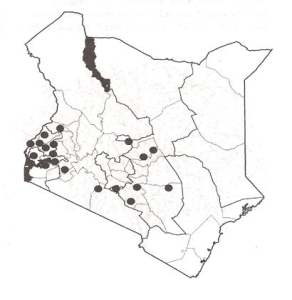 Embu (Muu); Kamba (Kyoo); Kikuyu (Muu); Luhya (Olusiola); Bukusu (Kumusoola); Luo (Siala); Meru (Muu); Nandi (Mobet); Somali (Sogdu); Turkana (Ekokwait). It is native to Ethiopia, Kenya, Tanzania and Uganda. 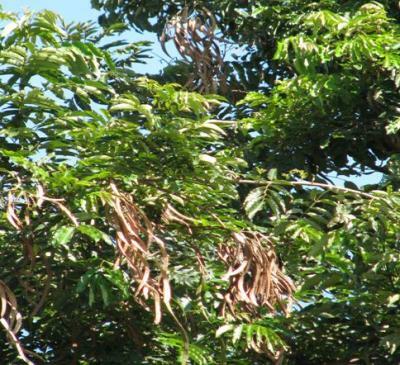 It is tropical African tree common in the Lake Basin and highland areas, up to 2,000 m above sea level. The species is widely used in western Kenya. The wood is fairly termite resistant. It stands acid heavy clay soil, but not water logging; prefers red loam and has deep roots. Altitude is 900 - 2000 m, Mean annual temperature: 12 - 270C, Mean annual rainfall: 800 - 2000 mm and it flourishes in agro-ecological zones II - III. It is propagated by use of seedlings and wildings. It grows fast and coppicing may be employed in their management. They take between 15 - 30 yrs to mature and may be found in plantations, amenity gardens and agroforestry systems. Plants can attain growth rates of more than 2 m/year. They should be planted in a deep hole, as the roots are long. Trees can be pruned and pollarded to reduce shading and are coppiced when they are about 1.7 m in height. Pods should be collected from the trees after they turn grey. Apiculture: M. lutea provides good bee forage. Fuel: Trees are a source of firewood and produce good charcoal. Fuel wood is used to cure tobacco in western Kenya. Timber: The wood, which is fairly resistant to termites, is used for furniture, poles, posts, tool handles and boat building. Medicine: Leaves are known to have medicinal value. Other products; walking sticks, banana props and mulch. Erosion control: Recommended for use in soil-conservation. Shade or shelter: The species provides useful shade and acts as a windbreak. Soil improver: It provides mulch, which enhances soil-moisture retention and increases organic matter. Ornamental: Attractive and worth planting as a screen or background tree for gardens and on golf courses. Boundary/barrier/support: M. lutea poles can be used as props to support banana trees. Young trees are often attacked by shoot borers, which cause crooked stems.